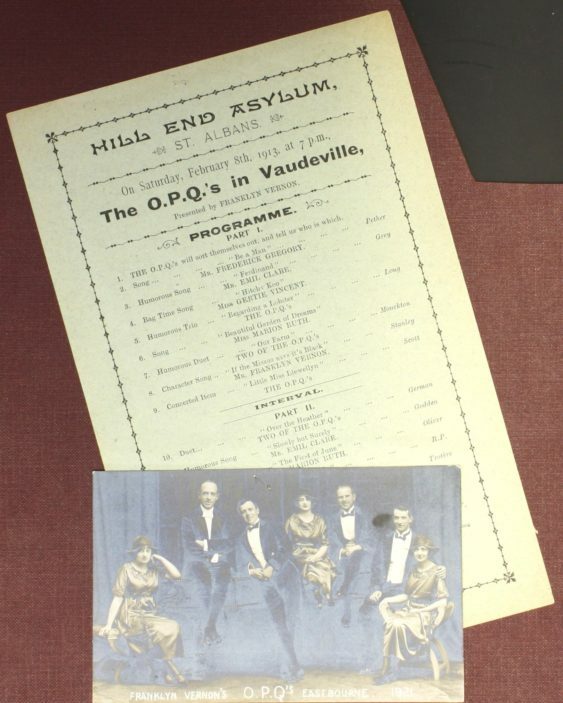 The OPQs in Vaudeville | Hill End, Entertainment | Out of Sight, Out of Mind? On Saturday February 8th 1913, Hill End’s entertainment came in the form of the ‘OPQs’. This group may have been a comedy singing theatre act as suggested through the titles of their songs, such as ‘If the Missus says it’s black’. Attached to the programme is a photograph of the OPQs. This page was added on 17/06/2010. I would be very interested in hearing from anyone with any information regarding the Olympia Players Quintet and its founder, Mr Franklyn Vernon, who is my great grandfather on my mother’s side. I know that they played the Pier at Weston-super-Mare for ten years and in the 1920s moved to Eastbourne, till the company disbanded in the mid to late 20s. I have some photos of Franklyn as the Mad Hatter and with the OPQs, which are dated, but any further information would be greatly appreciated. Interested to see the picture of the OPQS. My grandfather Franklyn Vernon (stage name) was the founder of the group and they performed in many places and I believe other asylums. My grandfather was a comic and serious stage actor and played the Mad Hatter in London Theatres. I have more info if interested.